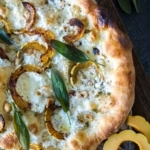 Delicata squash sage burrata pizza has earthy flavors found in my garden. I love cooking with foods that I grow or seasonal delights from my local farmers market. 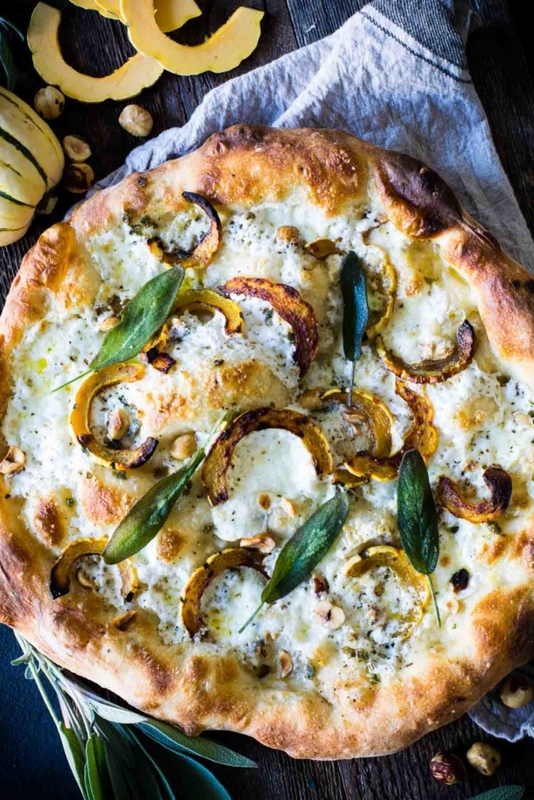 Delicata squash sage burrata pizza is topped with crispy sage and hazelnuts. Isn’t everything great topped with hazelnuts? I can’t think of anything I wouldn’t put hazelnuts on…can’t think of a thing. The dough I used is Jim Lahey’s recipe for amazing no knead pizza dough. King Arthur Flour has a step-by-step photo’s and instruction for this easy to prepare dough. According to Flourish it will be the best pizza you will ever make. I have to agree. 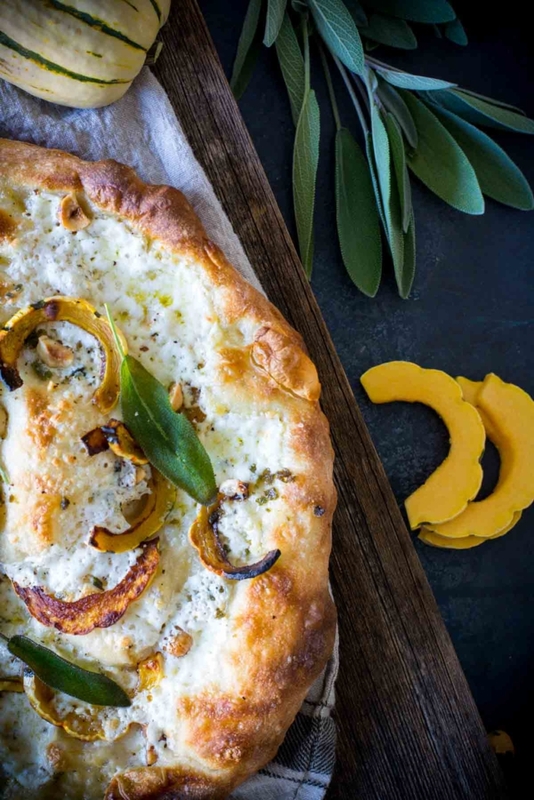 The crust of this delicatta squash sage burrata pizza was crisp, light, and fabulous. 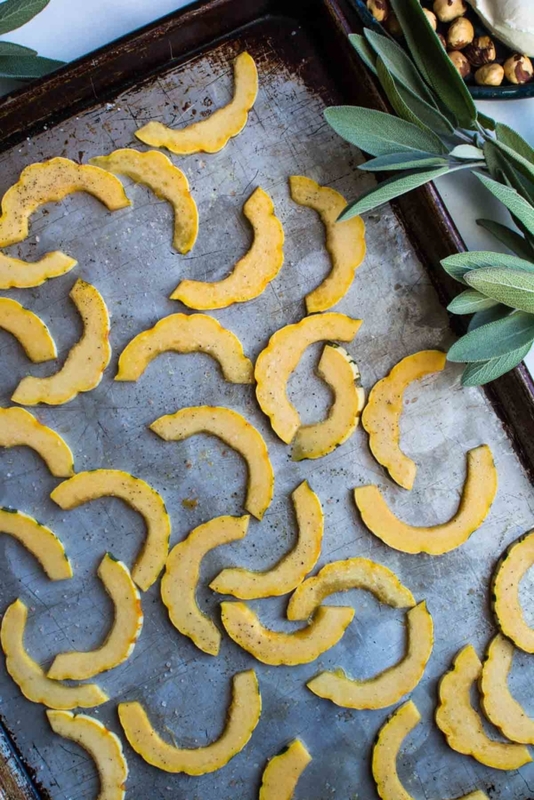 Begin by cutting the delicata squash in half lengthwise. Scoop out seeds. Slice about 1/4-inch thick and place on a baking sheet that has been drizzled with olive oil. 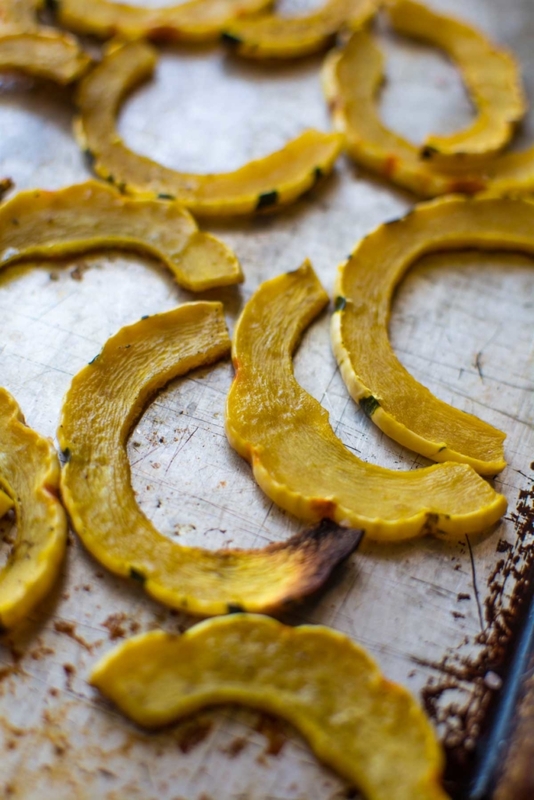 Toss the squash to coat in oil. Lightly salt and pepper. Place in a 350 F oven and back for about 8-10 minutes or until beginning to brown. Meanwhile, was and dry fresh sage leaves. Heat about 2 tablespoons of oil in a skillet. 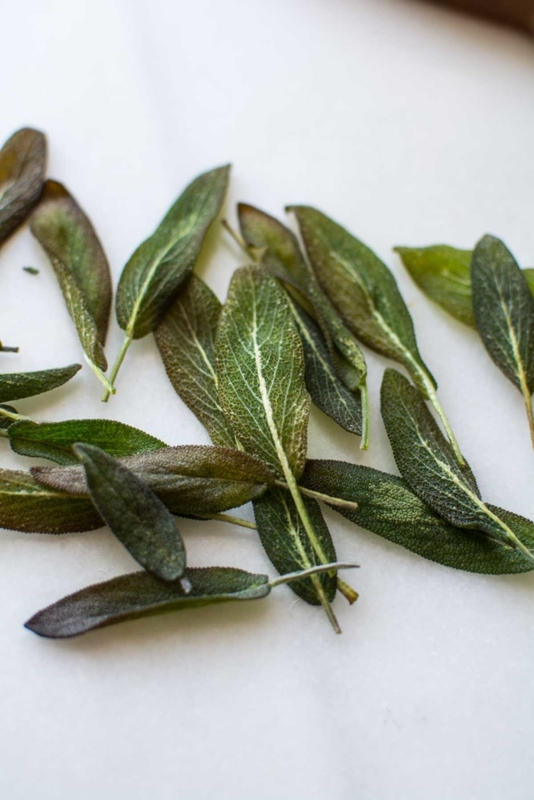 Drop in sage leaves a few at at time. The sage leaves will cook fast. Keep an eye on them because they will only take about 10-15 seconds. Remove from oil onto an absorbent cloth. Repeat with remaining leaves. Set aside. If you’re using a pizza stone or steel, place in a 550 F degree oven. Pizza can be made on an oil baking sheet. On a floured surface, carefully form dough into a large 12 to 14-inch round. Two smaller pizzas can be made with one pound of dough, but I wanted one large pizza. 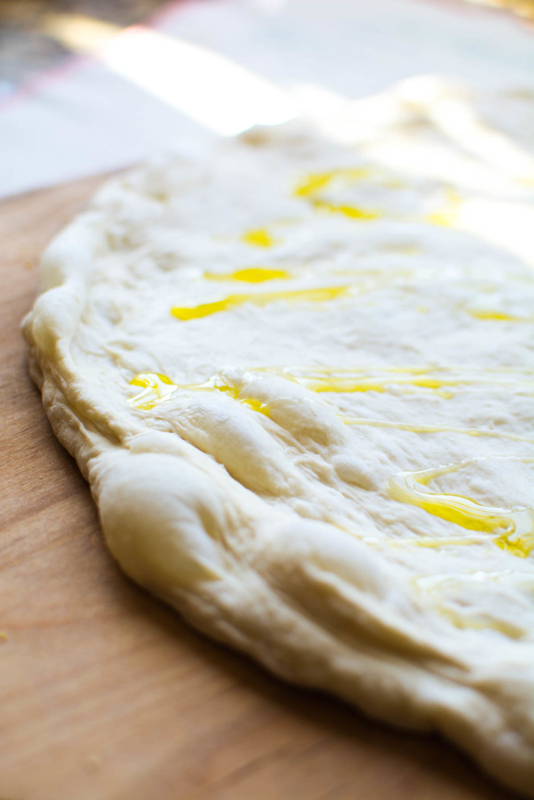 Drizzle with olive oil then spread around the dough gently with the back of a spoon. 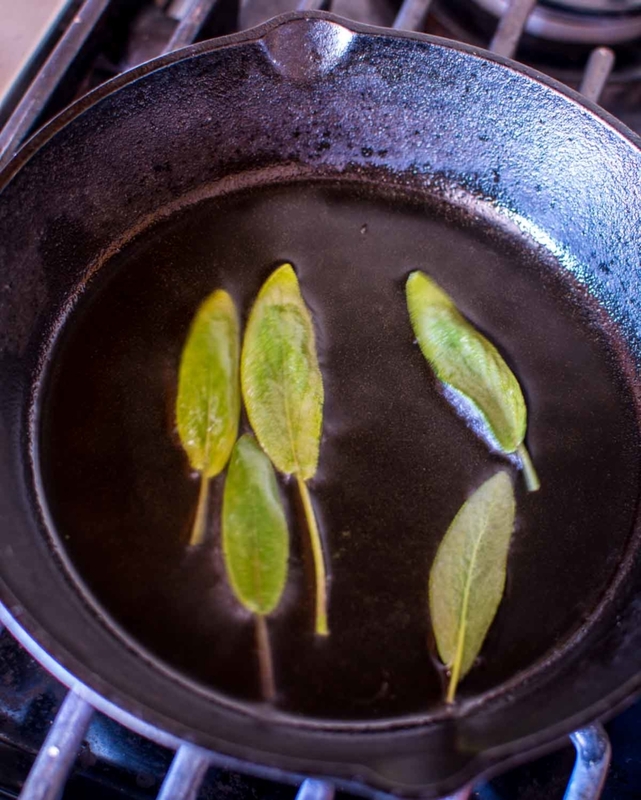 Chop a tablespoon of crispy sage, and sprinkle over olive oil. Reserve about 6 leaves for the top of pizza. 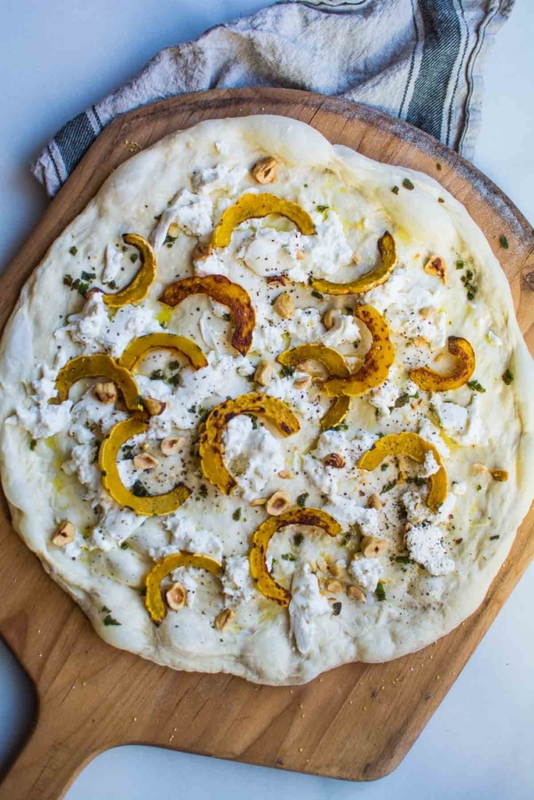 Pinch off pieces of burrata and drop over the dough followed by roasted squash and hazelnuts. Sprinkle with fresh ground pepper and a pinch of salt. Gently slide onto heated stone and bake for about 10-12 minutes or until golden brown and burrata is bubbling. Cool slightly before slicing, if you can possibly wait. Top with remaining crispy sage leaves. 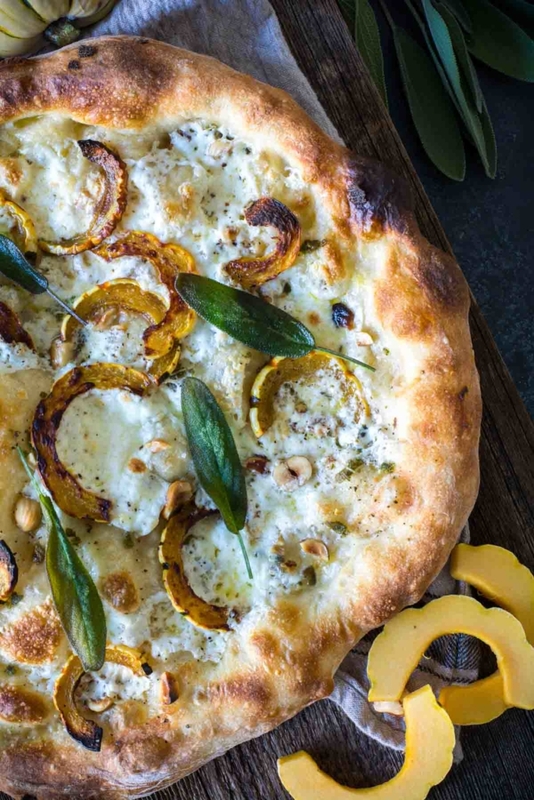 Delicata squash sage burrata pizza is topped with crispy sage and hazelnuts. Cut delcata squash in half and remove seeds. Cut into 1/4-inch slices. Place on a lightly oiled baking sheet and bake for 8-10 minutes or until beginning to brown. Set aside. 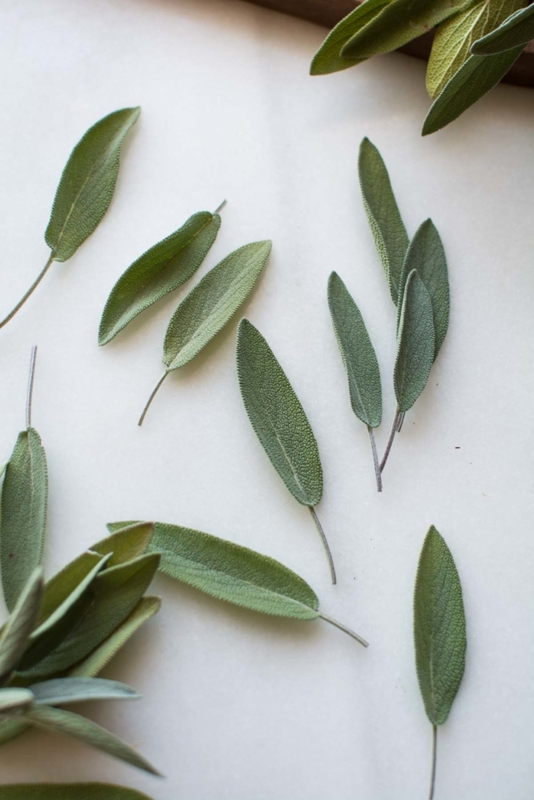 Wash and dry sage leaves. Heat a small skillet with 2 tablespoons oil. Add leaves and cook for 8-10 seconds or until crispy. Set aside 5-7 whole leaves for garnish. Chop remaining leaves. Set aside. Preheat oven and pizza stone or steel to 550F degrees. 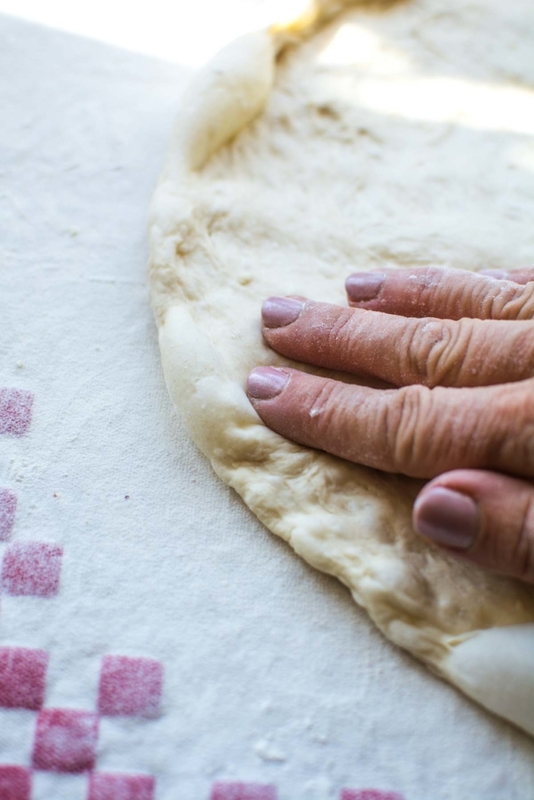 On a lightly floured surface gently shape dough into a 12-14 inch circle. Place dough on a floured pizza peel. Drizzle with olive oil and gently spread with the back of a spoon. Sprinkle with a tablespoon of chopped crispy sage. 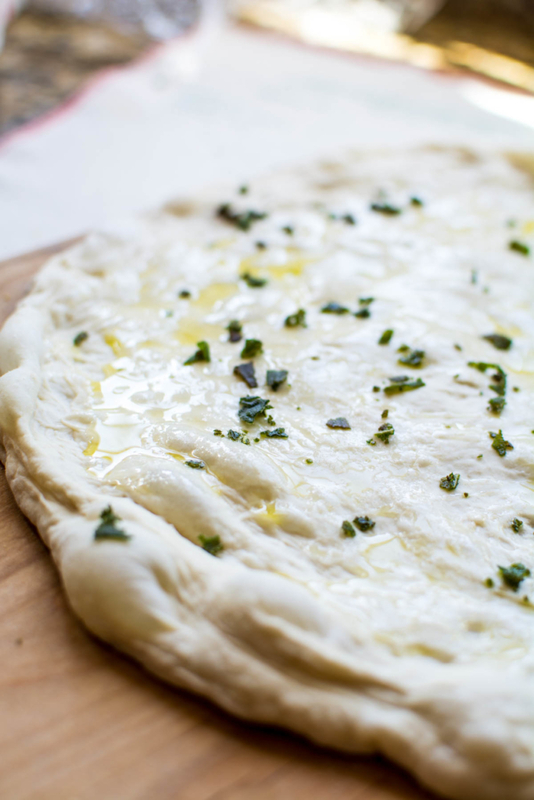 Pinch off pieces of burrata cheese and and drop onto pizza dough. 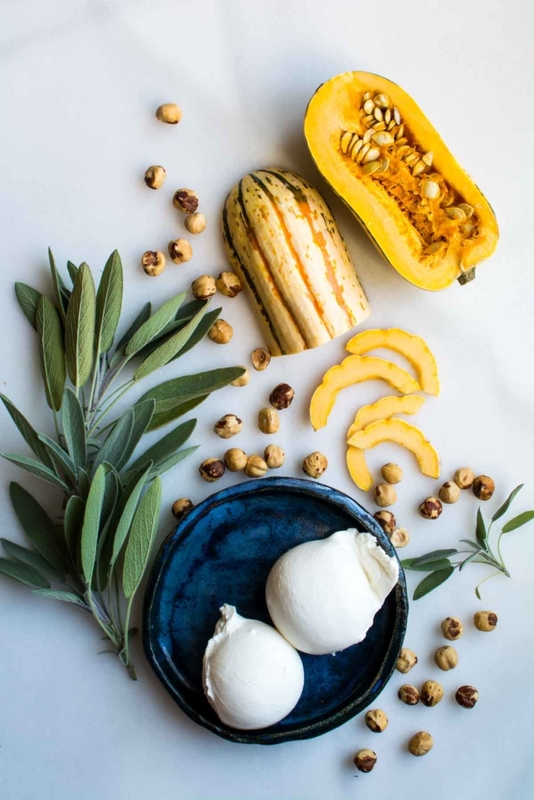 Layer with roasted delicata squash and hazelnuts. Gently slide pizza onto heated stone or steel. Bake for 10-12 minutes or until golden brown and cheese is bubbly. Enjoy more of summer vegetables with my Sweet Roasted Corn Bacon and Burrata Pizza. Topped with roasted corn on the cob, bacon, ricotta and finished with creamy burrata. More pizza recipes on Simply So Good.